Benjamin Mendy should be back in training with his Manchester City teammates in March – according to his friend Bernardo Silva. 23-year-old Mendy, City’s most expensive buy last summer, has been out of action since rupturing knee ligaments in September, and it has been a long recovery for the left-back. His hard work in rehab will soon see him back on the training pitch, with Bernardo revealing some promising news to RMC Sport in France when asked about Mendy’s chances of making the World Cup. “Mendy at the World Cup? Yes, of course it’s possible. He’s someone who works a lot,” the Portuguese winger said. “I think he’ll be with us in three weeks. If he starts to play and he recovers well, I think he’ll be there (World Cup). I hope so for his sake. 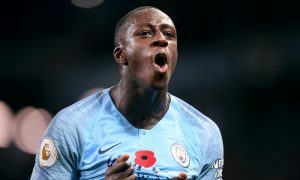 Even though he is nearing a return to training, Mendy’s recovery will continue to be taken step by step and it’ll take a significant amount of time for him to return to competitive matches. The signs are good though, and the head of the ‘Shark Team’ could be back on the pitch even before the season ends.